HANOI, Vietnam — President Donald Trump said Sunday that he's "with" the U.S. intelligence agencies that have concluded Russia meddled in the 2016 election, despite repeated denials from Russian President Vladimir Putin. "I believe [Putin] believes that" Russia didn't meddle, Trump said, walking back convoluted and controversial comments on the subject from one day before. "I believe that he feels that he and Russia did not meddle in the election," Trump said. 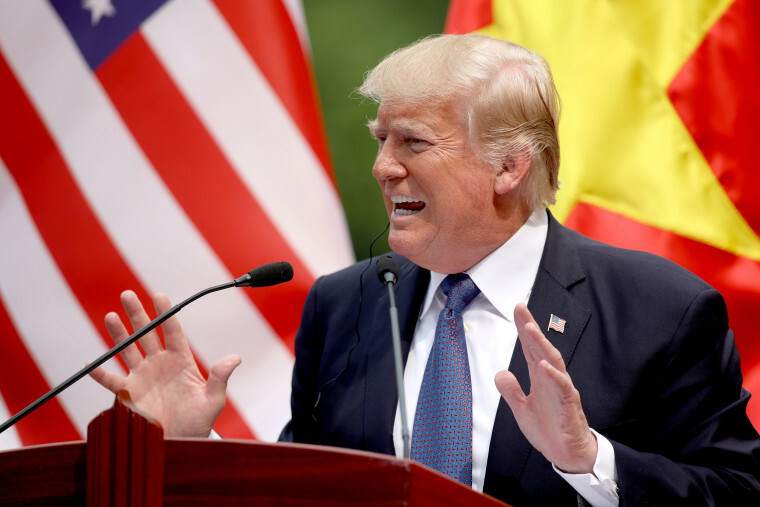 "As to whether I believe it or not, I'm with our agencies — especially as currently constituted," Trump said during a joint press conference here with Vietnamese President Trần Đại Quang Sunday morning local time. It's some of the clearest terms Trump has used on the issue, saying he believes U.S. intelligence agencies, while also continuing to push for better relations with Russia so as to deal successfully on other issues. But his language was notable, considering his comments Saturday where he bashed intelligence officials in charge during the Obama administration. "They're political hacks," the president said of former CIA Director John Brennan, fired FBI Director James Comey, and former Director of National Intelligence James Clapper. But even after those men left their respective agencies, the conclusions relating to Russia's interference in the 2016 election have not changed. Trump sparked a firestorm on Saturday when he told reporters aboard Air Force One that he once again heard denials from Putin during short conversations they shared at APEC, and "[Putin] said he absolutely did not meddle in our election. He did not do what they are saying he did." But the president was unclear on whether or not he believed Putin's denials, saying at the time: "Every time [Putin] sees me he says, 'I didn't do that' and I really believe that when he tells me that, he means it." Sen. John McCain, R-Ariz., chairman of the Senate Armed Services Committee, criticized the comments, saying in a statement: "There's nothing 'America First' about taking the word of a KGB colonel over that of the American intelligence community." Pressed on whether or not he believed Putin, Trump at the Hanoi appearance preferred to focus on other things. "Look," he said, "I can't stand there and argue with him. I would rather have him get out of Syria, to be honest with you. I would rather ... get to work with him on the Ukraine," Syria, and other issues of concern to the global community. "What he believes is what he believes. What I believe is that we have to get to work," Trump said. Trump has repeatedly cast doubt on the conclusions of the U.S. intelligence community about Russian interference in the election. A report published in January said that Putin ordered an influence campaign "to undermine public faith in the U.S. democratic process, denigrate Secretary Clinton, and harm her electability and potential presidency," and that "Putin and the Russian Government developed a clear preference for President-elect Trump." House and Senate Intelligence committees are investigating alleged Russian interference in the election. Special counsel Robert Mueller is also investigating. A former Trump campaign manager Paul Manafort and Manafort's longtime business associate were indicted on charges of money laundering and other counts less than a week before Trump departed for Asia. Manafort and Rick Gates have pleaded not guilty. The charges center on lobbying work before Manafort joined the Trump campaign. George Papadopoulos, who had been a foreign policy adviser to Trump during the campaign,has pleaded guilty to lying to federal agents about his contacts with Kremlin-connected Russians.